In further consolidation in the Indian telecom sector post the entry of Reliance Jio, Bharti Airtel said that it will acquire rival Telenor India to further augment its customer base and network. The acquisition will add about 44 million subscribers to Bharti Airtel’s existing 266 million, taking the total to 310 million. It will still be behind the possible Vodafone-Idea combine, which will have 390 million users. 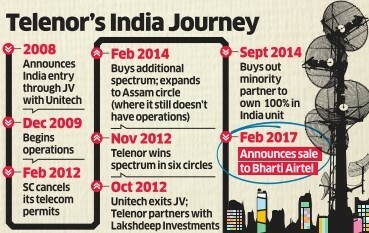 As part of the agreement, Airtel – India’s largest telecom service provider – will acquire Telenor India’s operations in seven circles, namely Andhra Pradesh, Bihar, Maharashtra, Gujarat, UP (East), UP (West) and Assam.